Description: Gene Autry Way intersects Interstate 5 (I-5) in central Orange County moving hundreds of thousands of vehicles per day. In addition the project area falls within a two-mile radius of major attractions such as Disneyland and California Adventure Park, Angel Stadium, the Honda Center, the Anaheim Convention Center (the largest convention center on the West Coast), nearly 20 hotels of the Anaheim Resort Area, and the future Platinum Triangle Development. Description: Various national railway projects across the United States. Description: Ashlar Stone texture impressed into Soundsorb to prevent sound reflections into neighborhood. Description: Two colors of stain on this precast SoundSorb wall create visual interest as well as provide functionality of buffering highway noise from area residents. Description: Soundwalls featuring SoundSorb acoustical material trap noise from both the ground and the elevated sections of this railway, keeping it from reflecting to area businesses and residential areas in this densely populated area. In addition to the walls, SoundSorb blocks were made to line underneath the rails as well, to absorb the wheel noise of the speeding trains. Description: West Rail, Hong Kong's metro system, starts at Hung Hom Station in Yau Tsim Mong District and ends at Tuen Mun Station in Tuen Mun. West Rail averages 200,000 riders a year. More than 1.4 million square feet of SoundSorb was used on the railway's parapets to reduce noise the railway emits. Description: The addition to this Nashville Soundsorb soundwall on this highway was music to residents' ears, now that less traffic noise is making its way into neighborhoods there. The popular Ashlar Stone texture provides a natural look that is both durable and acoustical. Description: When administrators at this community hospital were looking for a way to reduce noise generated by HVAC equipment, they turned to CSI's area licensee to create an enclosure that was functional as well as attractive. Description: Outside the Chicago area, the Canadian Railway heads north and through the neighborhoods of Des Plaines, Illinois. The local residents are no longer disturbed by the noise pollution. 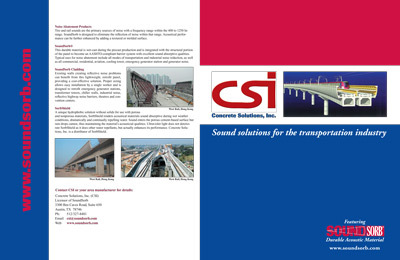 CSI's licensee installed SoundSorb on both sides of this elevated railway project. The panels on the outside of the railway capture ambient sound from the city, while the panels inside quiet noise from the rails themselves. This is important because trains act as moving walls, so the SoundSorb keeps the rail noise from reflecting off of the train itself and over the wall to area residents. Description: A custom block texture and geometric designs add visual interest to this highly effective soundwall, abating train noise from surrounding areas. Description: Beautiful aesthetic imprints plus the benefit of SoundSorb's sound-absorbing technology have created happy residents. Some even had blankets covering their windows before the noise abatement project began, but now they're able to remove them as the traffic noise from an area highway is much more subdued thanks to SoundSorb. Description: Lining this water pump station enclosure with SoundSorb means less noise pollution for employees and area residents. An Ashlar Stone texture was used to beautify the project so it didn't detract from the building where it is attached. Description: Existing reflective soundwalls on this highway project were retrofit with 2x2 SoundSorb tiles, saving the cost of removing those original walls and replacing them with complete soundwalls. Description: Nine different murals decorate this large soundwall project that had the neighbors celebrating over the decrease in traffic noise, thanks to SoundSorb. Description: Two 20-foot-long sound-absorbing panels were stacked horizontally along I-55, and then stained with an aesthetically pleasing color that is harmonious with the surroundings. Description: This project features a CMU block reflective wall and a SoundSorb wall that mimics its look, as noise abatement properties were only needed in specific areas along Highway I-580. This creates a continuous look while providing sound mitigation where it was needed the most. Description: This soundwall shows how SoundSorb can be precast with the highway crash barrier and shipped as one unit to the installation site. This particular SoundSorb wall saves space by integrating the soundwall with the barrier. Colorado random drag texture that add visual interest as well as sound absorption properties. Description: A beautiful mixture of graphic artistry is displayed in detailed SoundSorb panels of multi-colored, stained "old brick," accented with white cement walls featuring native birds in their natural environment. The local historical society was also involved in the project, offering suggestions on the brick pattern and design, in order to mesh with community surroundings. Description: Beautiful landscaping accents a functional yet attractive soundwall that replicates a majestic mountain scene. The mountains were imprinted into the SoundSorb, which is perfect for replicating virtually any graphic design. Description: An interesting mix of white texturized SoundSorb, black walls and clear acrylic panels makes this soundwall project in Australia a work of art.